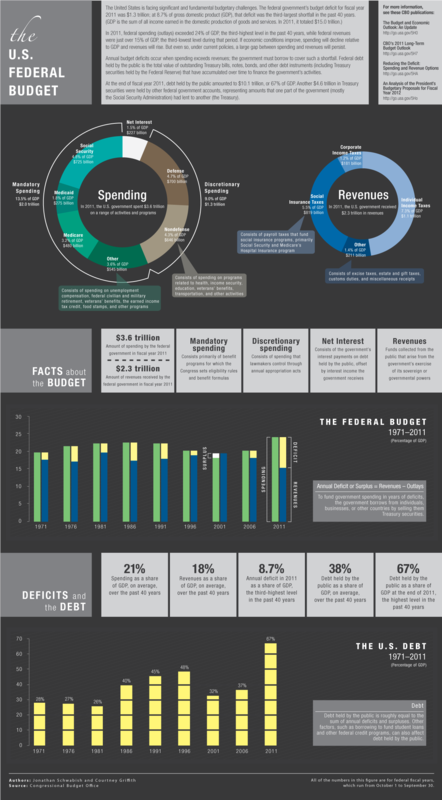 From the CBO (Congressional Budget Office) we have an interesting infographic for the 2011 budget. Go look at it. Is it any wonder why we're having a continuous debt crisis now? "Mandatory" spending is made up of four major categories: Social Security ($725 billion), Medicare ($480 billion), Medicaid ($275 billion), and "Other" ($545 billion, consisting of "unemployment, federal civilian and military retirement, veteran's benefits, earned income tax credit, food stamps, and other programs" - I interpret other programs as "pork"). Net interest on debt already accumulated in 2011 equaled $227 billion. Looking back only a few years, this current debt crisis could have been easily avoided - and forget about that "hindsight has 20/20 vision" BS. When your income only covers 2/3 of your spending, you're not going to be solvent for long.